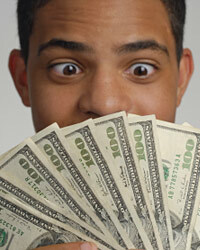 Getting a loan may be very easy for some people, while others have all kinds of difficulties with the process. Loans are a large part of our lives today, and they can be difficult to obtain with bad credit. Not impossible, though. When you apply for a loan, the first thing the lender will have you do is fill out an application so that they'll know a little about your life and financial situation. The application will tell them your family size, your address, your employment history, your income and your debts. Once they have the application, they'll usually order a credit report from one of the major credit reporting companies. The credit report will show them all debts you now have and have had in the last seven- to ten years. The credit report will also indicate the types of debts you've had—such as a mortgage, a personal loan, a credit card debt, etc. It will show the maximum amount borrowed, your monthly payment amount and how you paid the debt. The report will have a score, which can range as low as below 400 for poor credit to as high as 800-plus for excellent credit. The credit score is used by the lender to help determine what kind of risk you are as a borrower. If you've filed for bankruptcy, had a judgment placed against you or experienced other delinquencies, the lender will usually turn you down. However, if the lender is performing their job thoroughly and conscientiously, they'll question you about some of your accounts to make sure that they're accurate. They'll also want to know if there were any extenuating circumstances that led you to becoming delinquent. When you're been turned down for a loan or any type of credit, you have the right to know what credit report agency was used to help the lender make their decision. You also have the right to contact that credit report agency and obtain a free copy of your credit report within sixty days of being denied credit. When you receive your report, be sure to look it over carefully to ensure that there are no mistakes. Mistakes are not uncommon, such as a paid debt that's still being reported as unpaid or another person's debts on the report. This latter case often happens in situations where there are a "Junior" and "Senior" members in the same family. Even though the individual's Social Security number is meant to be the primary determinant, errors still occur. If your credit report is not accurate, discuss this with the lender. If you can demonstrate that you have the ability to repay a loan, the lender may reconsider. Sometimes, if you tell the bank you are going to try elsewhere, they may also have a change of heart (especially if your financial situation is borderline). However, if they stick with their denial, you can at least learn from it. In most cases, the lender will give you the reasons why they turned you down. This makes it easier for you to correct the situation or discuss it with your bank. The important thing is to not give up; getting a loan after being refused may be a bit difficult, but it's certainly not impossible.